On April 29, 2010, Mr. Jung-Ho Suh, chairman of the Ambassador Group was awarded 2010 Alumnus of the Year by the University of Nevada, Las Vegas (UNLV), in USA. UNLV is reputed as the world’s most prestigious university for hotel management and select the alumnus of the year every year. This award recognizes hospitality alumni who have made meaningful contribution to the industry and university during their career. .
At UNLV, Mr. Suh earned his B.A in hotel management in 1982 and MBA in 1984. He currently operates 9 Accor-Ambassador hotels in 5 major cities in Korea under partnership with Accor, a French hospitality group. 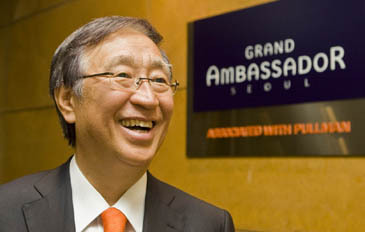 The Ambassador Group has grown to a leader in hospitality industry in Korea and Mr. Suh took the honor from his alma mater for his contribution to the tourism industry of Korea.